Day 1: Lake Mburo National Park. On this day the guide will drive you to Lake Mburo National Park, having a stopover at the Equator for the water experiment and picture then latter proceed on to the Park entering with a mini game drive in search for wildlife that includes the Zebras, Impala, Topes, Water buck, Eland, Klipspringers, Dwarf Mongoose, Warthogs, Bush Bucks and Leopards among others. We latter check in to the service of Mihingo Lodge for dinner and overnight. Day 2: Lake Mburo National Park. This morning you will take a Horse ride around the Park as you view the wildlife. This is a memorable experience as we view wildlife from deferent habitats a Horse back. We come back to the Lodge, relax around, have our lunch and latter in the afternoon go for the Boat cruise on Lake Mburo. This normally takes about one and half hours, we come back to the Lodge in the evening for dinner and overnight. From Lake Mburo Park you will transfer to Ishasha the Southern sector of Queen Elizabeth National Park, passing through the rolling hills of Mbarara and Tea plantations of Bushenyi and check in to the service of Savannah Resort hotel for dinner and overnight. Day 4: Ishasha - Kyambura Gorge. Day 5: Queen Elizabeth National Park. Maramagambo. After breakfast, we drive to Maramagambo Forest for a Nature walk in search for wildlife that includes the Black & White Colobus, Red Tailed and Velvet Monkeys, Splendid Starling, Red Headed Bluebill, Red Caped Robin Chat, and Red Tailed Bristalbill among others. 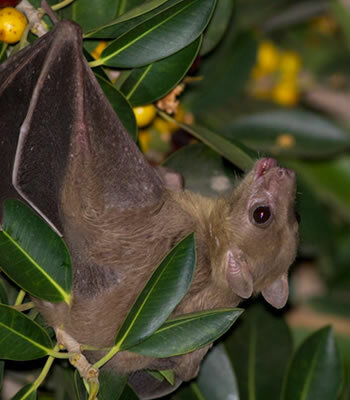 In the walk we also visit the Bat cave that Houses millions of Egyptian Fruit Bats, we latter transfer to Mweya Safari Lodge for lunch, have a free afternoon, dinner and overnight. Day 6: Queen Elizabeth National Park. The day begins with an early game drive towards the Kasenyi plains in search for wildlife that includes the Buffaloes, Water Buck, Kobs, Hyenas, Warthogs, Lions and Leopards among others. And for Birds lovers, you will like it because this Park is said to have the highest concentration of birdlife as compared to any Park in the World. We come back to the Lodge, relax around, have lunch and latter in the afternoon at about 3:00pm, we go for the boat cruise on the Kazinga Channel for yet another but deferent view of the wildlife at close quarters as they come to cool off at the shores of the Channel. We come back later in the evening, dinner and overnight at Mweya Safari Lodge. Day 7: Kibaale National Park. After breakfast leave for Kibale National Park driving through the Crater Lakes region and drive North wards along the foot hills of Rwenzori Mountain Ranges, these constitute the western Rift Valley and form the boundary between Uganda and Congo. With en-route lunch at Kasese, arriving in the afternoon and check in to the service of Primate Lodge Kibale, have a free afternoon, dinner and overnight. Day 8: Kibaale National Park. After breakfast move to the Park offices for registration and briefing before you start the trekking in the thick forests of Kibale. The Trekking may take about three hours in search for Habituated Chimpanzees. The forest also harbors about five primate species that include the Black and White Colobus, Red Colobus, Red tailed, Lhotse's Monkeys and Grey cheeked Mangbey. It is also home to a variety of bird species including the rare Green Breasted Pita. In the evening go for a nature walk in the Bigodi wetland which is also very rewarding. Return to the Lodge for dinner and overnight. Day 9: Semuliki National Park. After an early breakfast, depart for the Sempaya Hot Springs in Semuliki national park which is a good nature walk at Sempaya. The guide will have packed lunch arranged before leaving your accommodation to be enjoyed as a picnic lunch while exploring the real Africa’s natural gifts, return to Fort Portal and check in to the service of Rwenzori View Guest House for dinner and overnight. Day 10: Hoima - Murchison Falls National Park. After breakfast, we depart for Murchison Falls National Park. This is a full day driving which will take you between 9-10 hours of drive. You will reach the park in the late afternoon. Check into the service of Nile Safari Lodge for dinner and overnight. Day 11: Murchison Falls National Park. After breakfast, drive down to the ferry and cross the Nile to the Northern sector of the park where we shall do our game drive in search for wildlife that includes elephants, buffaloes, waterbucks, giraffes, oribis, hart beasts, Kobs, warthogs, lions, jackals, leopards according to the luck of the day and a variety of savannah and woodland birds can be seen. The drive normally takes 3 4 hours according to how much you see and the interest you have in them. We drive back to the camp, relax for a while, have lunch and then at 2:00pm we go for the boat cruise on close quarters as the animals draw down the river bank to cool off. 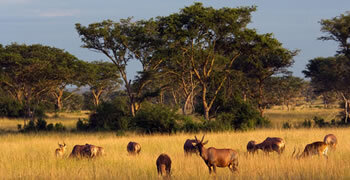 Here you get a chance of seeing many schools of hippos, crocodile, buffaloes, elephants and a variety of water birds. We come back after about 3 hours to the Lodge for dinner and overnight. After breakfast, you will do a mini game drive as you get out of the Park and later return to Kampala to catch your flight back home.